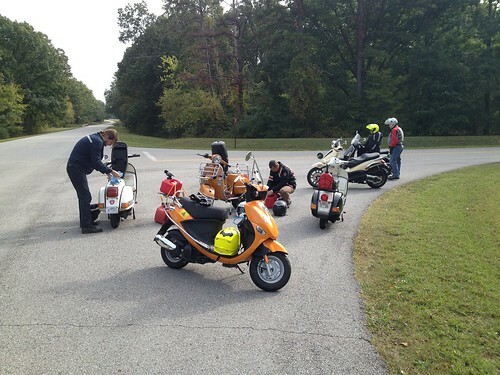 Modern Buddy : Ride Report "The Natchez Trace"
Ride Report "The Natchez Trace"
Posted: Sat Sep 29, 2012 8:48 pm Post subject: Ride Report "The Natchez Trace"
Today our local scooting community Scoot Nashville was doing our first and hopefully annual "Race the Trace". 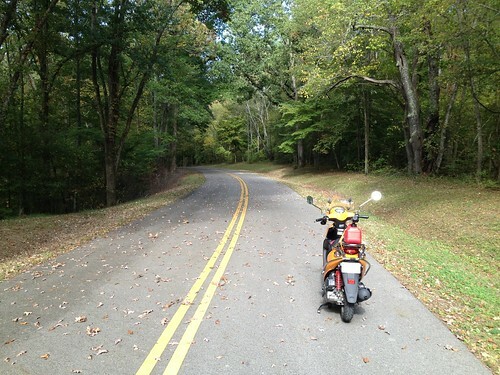 As I am not originally from this area I did not know that much about the Natchez Trace. Here is some information for you. 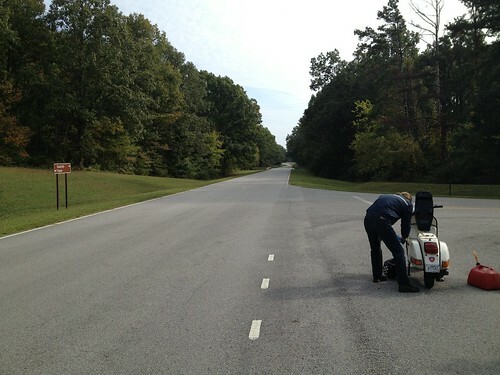 This was a race from Lovelass Cafe Nashville (http://www.lovelesscafe.com) to Tupelo Mississippi. Unfortunately I wasn't able to do the whole thing do to family commitments, But I did do about 80 miles one way of it. It was some great riding, if anyone gets to this area I really recommend it. I will do this again, and do more of it. I did not get a picture of the start as I showed up just as everyone was pulling out. There were about 15 scooters. Only my buddy and a friends buddy were representing. There was 1 stella too. We started and didn't stop for 78 mile. This gives you an idea of how there was no one on this road. It was very peaceful and beautiful. I stopped at Merryweather Lewis National Park right of the Trace. I had no idea that this was here until I started planning this trip. This is the place where Merryweather Lewis (Think Lewis and Clark, yeah that guy) died and was buried. Apparently he either shot himself twice or was shot twice here. Sorta a sad end for someone immortalized in US history. By the time I got to civilization on the way home, it was lunch time, so I parked at Starbucks in Brentwood had my packed lunch with a coffee and got some water proof spray from REI. This was my route back. All in all, 202 miles round trip. Done from 7:15 am until 12:35 pm. I have to say the buddy performed well. Only hicup was I ran out of gas going 70 bmph. I actually wanted to see how far I could go before I had to fill up. 121 miles. I then filled back up and kept going. Now in the comfort department my rear got seriously numb, sore and all around was uncomfortable. Need to figure out how to make it more comfortable next time. Thats all folks, thanks for reading. The bed was too comfy at 6 a.m., or I would have done that much of the ride with ya. Funny thing Jeff, I have been to 3 or 4 Tuesdays meets ups this year and still haven't met you yet. I can't make most things but one day we shall meet. 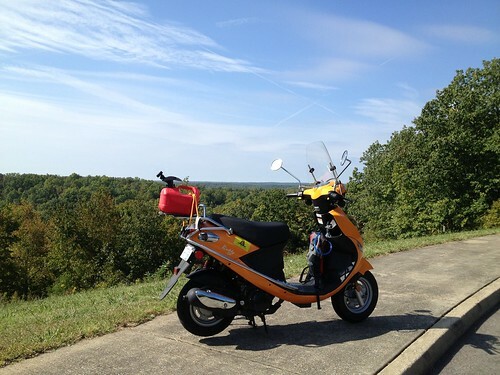 The Natchez Trace is pretty sweet. 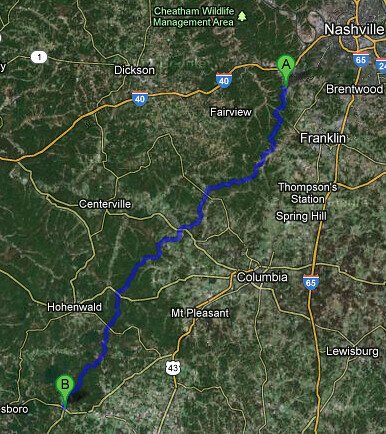 I'd driven the Nashville to Tupelo leg before, wish I had my bike for it. 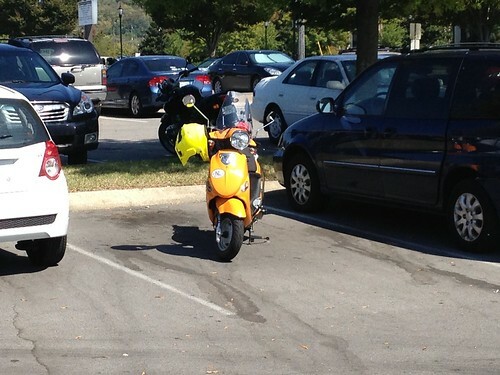 This reminded me of a thread I'd seen on Total Ruckus; guy rode the full Trace both ways on a 50cc Ruckus. Consider it incentive to go the distance on your next run! I was at last Tuesday's, and two weeks prior. I've been pretty scarce since the rally in June. I'm going to try to get to every other one, at least, through the winter. The job, though... some days it just kicks my ol' keester. Loveless Cafe! 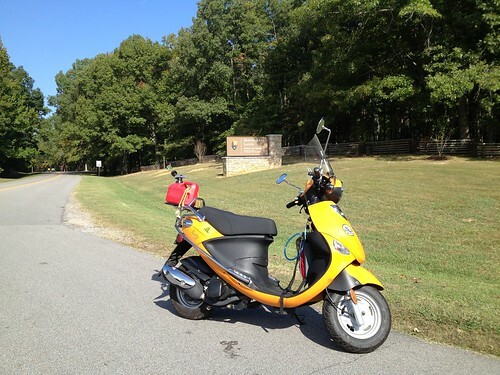 Natchez Trace!! Scooters!!! Race!?! Can somebody please send me an e-mail heads up before this event next year? Coffee & Pie at the Loveless is on me. I am so SOOOOO jealous. Nice photos! Thanks for posting that. If you don't wanna keep up with the main scootnashville site, we haz newsletter, too! Handy for those who're too far for the day-to-day stuff, but close enough to maybe wanna attend the bigger events. I'd love to do this ride. Maybe someday. Most incredible road I've ever been on! (haven't been on the Blue Ridge Pkwy yet). It goes on and on with almost no other cars, no lights, and beautiful scenery. 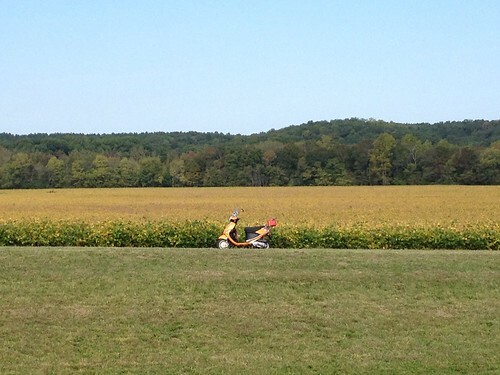 It just rolls gracefully through beautiful farmlands and plantations. The NTP is shown up to 1:03 of the video, then crossing the Mississippi. Also meant to mention to rfman81... the Meriwether Lewis burial site is the farthest south I've traveled the Trace, so far, too. I did that on Bad Penny, the Kymco People 250. 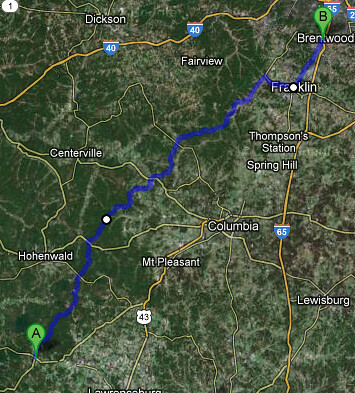 Almost ran out of fuel... had to ride 22 miles off the Trace to get to a gas station in Fly, TN! This gets difficult, as no signage is allowed on the Trace to show you where to find gasoline... silly Federal Park System. :) Jason, the gent on the orange Stella w/the Corazzo 5 jacket, he had a spreadsheet with fueling stops. I hope it is serving them all well on the adventure! It is a real joy to ride, the right speed, lots of turns, and beautiful scenes everywhere. I often get on the stretch from Leiper's Fork to the Loveless Cafe whenever I have a few hours and want to clear the cobwebs. A lot of Harley's cruise that stretch on the weekends, but everyone is on their best behavior, and some of the HD guys actually wave. The Harley guys always wave on the Trace... IME. We'll have to meet up some weekend morning for breakfast at Puckett's or Loveless. I would be down to do this again just need about 3 weeks heads up prep the family. To clarify I actually made it past Merrytweather park. About 21 miles or so. All these pictures were taken on the way back as on the way down we were Racing!!! I was in 4th place when I stopped and turned around. Took my time to get home, stopped snapped pictures kind of thing. Talked to a guy on a old Indian that was pretty cool. He thought it was awesome I had put in 140 miles by 10:15 in the morning on a scooter. I am thinking back. I think something that got to me was the vibration on the ride, it has bothered me for some time but it is was noticeable more after about 1 hour riding. I am wondering if my front wheel is out of balance or something. Also the buddy doesn't really like my 200 lbs at 60 bmph. I cruises just right around 53ish. Boot scootin, let us know if you come down. 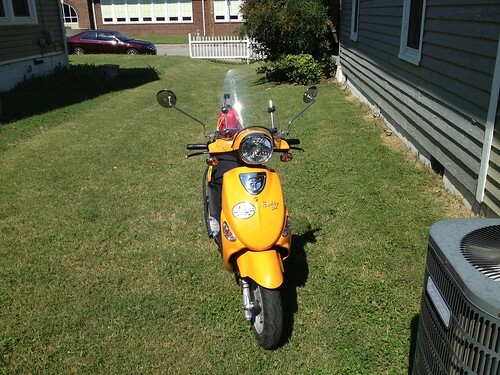 I am sure you will get some scoot Nashville support. Also meant to mention to rfman81... the Meriwether Lewis burial site is the farthest south I've traveled the Trace, so far, too. I did that on Bad Penny, the Kymco People 250. Almost ran out of fuel... had to ride 22 miles off the Trace to get to a gas station in Fly, TN! This gets difficult, as no signage is allowed on the Trace to show you where to find gasoline... silly Federal Park System. Jason, the gent on the orange Stella w/the Corazzo 5 jacket, he had a spreadsheet with fueling stops. I hope it is serving them all well on the adventure! haha, funny thing is, I almost ran out of gas and when I finally found one they didn't take credit cards. So I had to go another 10 miles to another gas station, coasting with the scooter off and everything! I made it without having to push though. I love riding the trace, but don't do it often enough. It's just a few miles from my house, nothing better on a fall Sunday afternoon to spend some time on it then head into Leipers Fork, and hit up Puckett's for an afternoon snack. 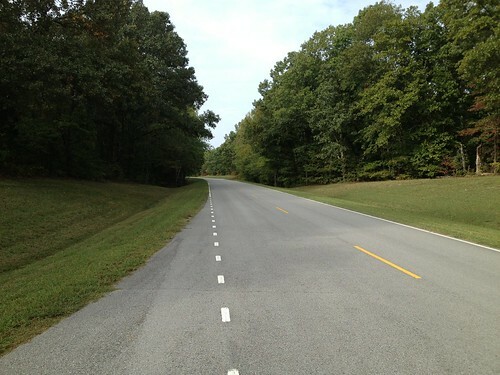 The trace was lovely when I rode it from the southern start to near Tupelo last March. What I couldn't figure out was why there were so few people on it, lovely Saturday afternoon (from Natchez to Jackson) in the low 80s. I was passed by a group of sports bikes who flew by despite my going about 8 miles over the posted speed on my Scarabeo 500. The next morning I don't think I saw more than a couple dozen the entire stretch from Jackson to Tupelo. Very peaceful and lovely before I cut over to meet up with a friend to ride the Dragon and other bits before picking up the Blue Ridge south of Ashford. That too was lovely and almost deserted but foggier than the Trace. If they weren't so far from Houston they would have been fun on the Buddy but the bigger, faster, better suspension for eating of the miles of the Scarabeo made it the better choice.